Hello, my name is Bobby! 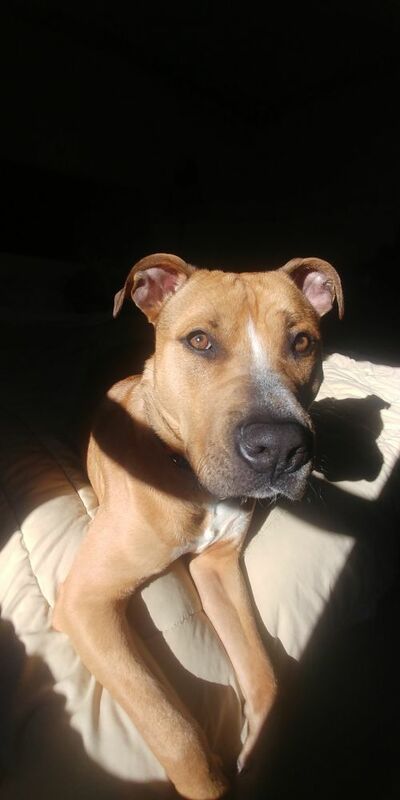 I'm a 1.5 year old pitbull/labrador mix. Even though I'm young I'm a big boy now, at 50lbs. I am just so excited and filled with life all I want to do is spend time with my human(s) playing and running around! I'm also super strong and enjoy playing tug the most. A game of fetch is great too but I'm not so good at giving back the stick hehe. Even though I have plenty of energy to burn, I also enjoy downtime and snuggling with my human friends on the couch after a long day. When I feel the close and comfort of my owners I sleep so soundly. I am always happy when I am with them, which is why it's very hard for me to be alone for long periods. I would do best in a home with someone who is willing to give me the time and attention I need, and who isn't absent most of the day. I am a high energy pup, and would require lots of playtime with my human, and plenty of time outside/at parks to exercise. I also have a tendency to play hard or jump, and since I'm so strong I could unintentionally hurt tiny humans in the home. So ideally I would do best with an active person or couple, or a family that has older children. I am healthy, neutered, up to date on my shots, crate trained, and house broken. My last household did not train me on all the human rules, so I wasn't very well mannered when I first entered my foster home. I would jump on the counters and other humans, and pull hard on the leash. But since then I have made great improvements and learned a lot. I no longer counter surf or pull on the leash! I occasionally still jump on human friends to greet them, because I just want to be on their level 🙂 I can also sit and lay down on command, and even give handshakes. I am very food motivated so I'm a quick learner! Even though I give my all during playtime, I am very tender and sweet with people otherwise, whether they be a stranger or someone familiar. Meeting new people is no issue for me. In fact, I just love to give kisses and lean my weight against you for pets (this is my way of hugging!) When I miss my friends/family and they come through the door again, I'll wag my tail ferociously and do a little howl to greet them. It's my way of saying "welcome home!" If you are interested in adoption, please fill out an application at www.alldogrescue.org, or send an inquiry via PetFinder. 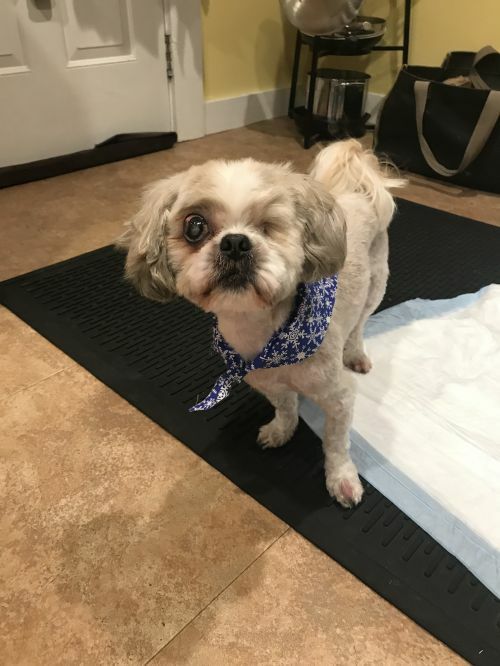 My name is Benji and I'm a neutered 10 yr old, 12 pounds Shih Tzu mix. If you didn't notice I have only one eye. I am looking for a home that has time for me, as I need drops in my eye 4 x a day. My perfect home is a loving place where I can live out the rest of my senior years, preferably in someones lap. I enjoy company and laying in my bed. I am working on house training. 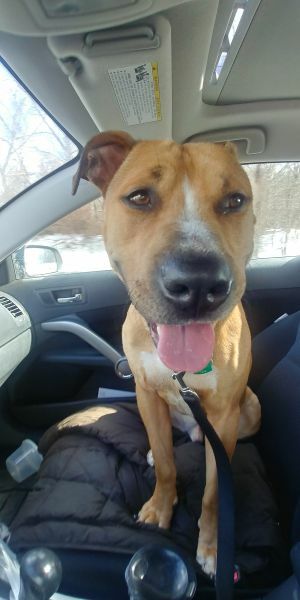 I am being fostered in Brockton Mass, If you would like any more info on me go to Alldogrescue.org and fill out an application and my foster parent will be in contact within 24-48 hours. When Gizmo walks he prances. He has a beautiful long pluming tail. He is a very sweet and loving dog unlike a lot of Chihuahuas. He walks great on a leash and he'll cuddle up with you when you sit down. He is a part of a bonded pair with his girl Coco.they are both about 5 years old. She was raised with him and they are very attached to each other. They will need to be placed together. Gizmo weighs ten pounds. Coco is seven pounds and is also up on petfinder. Gizmo is the one with the white in his coat in the photos. They are both very well behaved and really love people. Their adoption fee will be $600 for both of them. She's good on a leash, both dogs rarely bark and they like to cuddle. 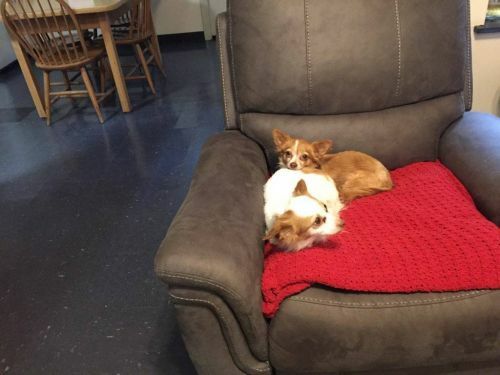 Someone will be very lucky to get these unusually friendly and well behaved chihuahuas. 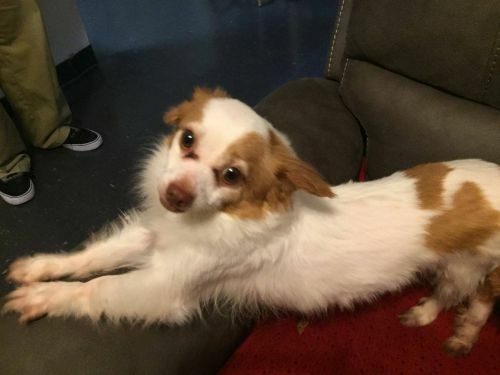 Coco is a 7 pound, long haired, 5 year old chihuahua who is very sweet and loving. She likes nothing better than to spend time with you. She is part of a bonded pair with her Gizmo. (She is the tan one in the photos) She's good on a leash, both dogs rarely bark and they like to cuddle. 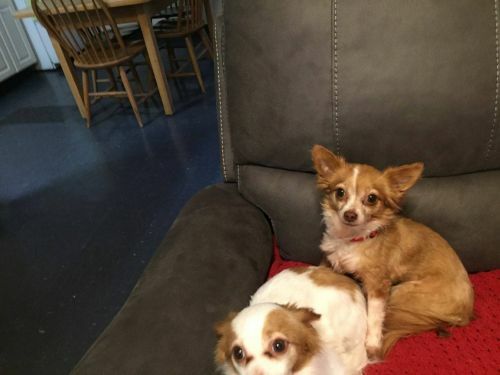 Someone will be very lucky to get these unusually friendly and well behaved chihuahuas. Their adoption fee will be $600 for both of them. When Gizmo walks he prances. He has a beautiful long pluming tail. He is a very sweet and loving dog unlike a lot of Chihuahuas. He walks great on a leash and he'll cuddle up with you when you sit down. He is a part of a bonded pair with his girl Coco.they are both about 5 years old. She was raised with him and they are very attached to each other. They will need to be placed together. Gizmo weighs ten pounds. 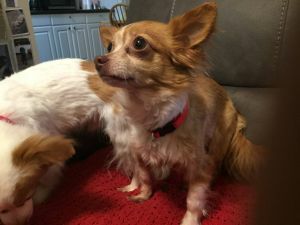 Coco is seven pounds and is also up on petfinder. Gizmo is the one with the white in his coat in the photos. They are both very well behaved and really love people. Their adoption fee will be $600 for both of them. 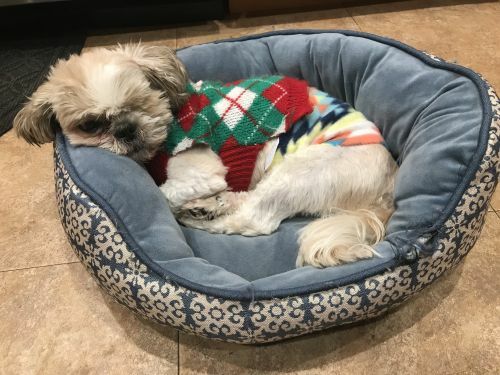 My name is Benji and I'm a neutered 10 yr old, 12 pounds Shih Tzu mix. If you didn't notice I have only one eye. I am looking for a home that has time for me, as I need drops in my eye 4 x a day. My perfect home is a loving place where I can live out the rest of my senior years, preferably in someones lap. I enjoy company and laying in my bed. I am working on house training. 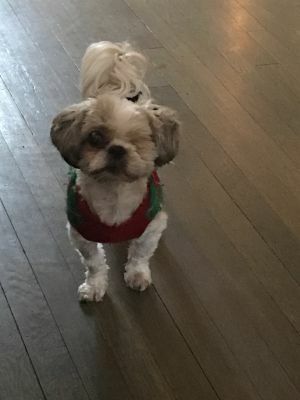 I am being fostered in Brockton Mass, If you would like any more info on me go to Alldogrescue.org and fill out an application and my foster parent will be in contact within 24-48 hours. Hello, my name is Bobby! 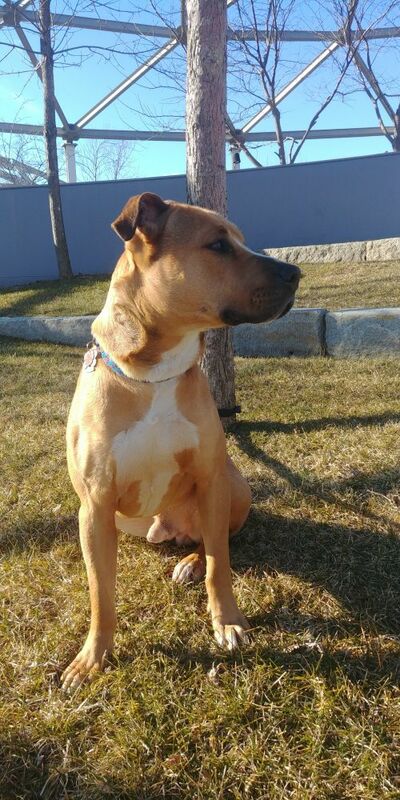 I'm a 1.5 year old pitbull/labrador mix. Even though I'm young I'm a big boy now, at 50lbs. I am just so excited and filled with life all I want to do is spend time with my human(s) playing and running around! I'm also super strong and enjoy playing tug the most. A game of fetch is great too but I'm not so good at giving back the stick hehe. Even though I have plenty of energy to burn, I also enjoy downtime and snuggling with my human friends on the couch after a long day. When I feel the close and comfort of my owners I sleep so soundly. I am always happy when I am with them, which is why it's very hard for me to be alone for long periods. I would do best in a home with someone who is willing to give me the time and attention I need, and who isn't absent most of the day. I am a high energy pup, and would require lots of playtime with my human, and plenty of time outside/at parks to exercise. I also have a tendency to play hard or jump, and since I'm so strong I could unintentionally hurt tiny humans in the home. So ideally I would do best with an active person or couple, or a family that has older children. I am healthy, neutered, up to date on my shots, crate trained, and house broken. My last household did not train me on all the human rules, so I wasn't very well mannered when I first entered my foster home. I would jump on the counters and other humans, and pull hard on the leash. But since then I have made great improvements and learned a lot. I no longer counter surf or pull on the leash! I occasionally still jump on human friends to greet them, because I just want to be on their level 🙂 I can also sit and lay down on command, and even give handshakes. I am very food motivated so I'm a quick learner! Even though I give my all during playtime, I am very tender and sweet with people otherwise, whether they be a stranger or someone familiar. Meeting new people is no issue for me. In fact, I just love to give kisses and lean my weight against you for pets (this is my way of hugging!) When I miss my friends/family and they come through the door again, I'll wag my tail ferociously and do a little howl to greet them. It's my way of saying "welcome home!" 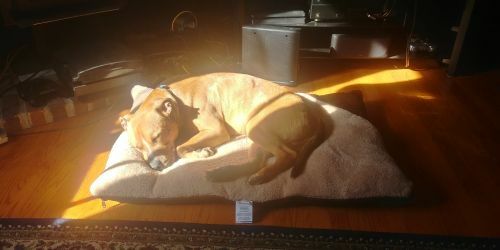 I am currently being fostered in Agawam, MA My adoption fee is $350 If you are interested in adoption, please fill out an application at www.alldogrescue.org, or send an inquiry via PetFinder. To adopt a dog from us, you must be over the age of 21. To begin the process, first fill out an adoption application. The foster provider will then set up a telephone interview to determine if you and the dog are a good match for each other. The next step is for you to come and visit the dog at the foster home. Then we will do a home visit at your residence before finalizing the adoption. The final step is for you to pick up your new dog from the foster home. Ongoing contact will be maintained with you to see how it’s going and offer training suggestions and behavior advice. The adoption fee ranges from $250-$500 for most adult dogs (decided on a case-by-case basis). This is to help defray the costs of spaying, neutering, transportation and other medical expenses. All dogs are spayed or neutered, examined by a vet, given medical shots and treated for any medical condition they may have, prior to adoption. Donations above the adoption fee are always welcome! To apply for one of our dogs, please fill out an Adoption Application. A volunteer will respond to your application within 48 hours. If you have a question about one of our dogs, you can contact us and we’ll be happy to try to answer it.